2. 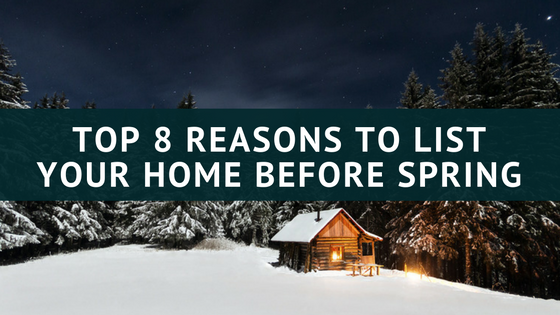 The holidays are actually a great time to show homes, holiday lights, décor and warmth can make potential buyers feel at home! 3. The closing process could go a bit faster, because lenders and title companies are less overwhelmed with tons of closings, like they are during the spring market. 5. The month of January is known to have the most corporate job relocations & transfers than any other month of the year. Usually, corporate employees who are transferring to the area are not willing to wait it out until spring in a hotel room. 6. You don’t need to worry so much about the landscaping & exterior appearance of your home, like you do in the summer months. All you need to worry about is shoveling the sidewalks and a path to all exterior doors, and that’s it! No planting, watering or trimming to worry about. 8. Buyers aren’t going to showings and open houses in snowy road conditions & negative temps just for fun. They’re going because they are serious buyers looking to find a home!